But honestly, three weeks and some odd days into our documentary-filming road trip, it’s how I feel. 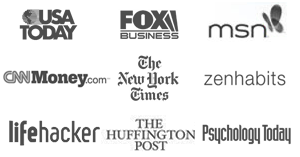 You see, we’ve interviewed at least 30 people so far, from a wide variety of backgrounds, experiences, and opinions. We’ve interviewed them on life, work, complacency, fear, social pressure, society, security, commitment, and a whole bunch of less serious topics. The process has been exhausting, but extremely rewarding. We’ve been blown away from the powerful responses during many of the interviews and humbled by the challenge we have to mold them all into a coherent story and purpose. We’ve had some people cry, some laugh uncontrollably, and some nearly jump out of their chairs in excitement when answering our questions. Unfortunately for the scared part of my brain, people have poured themselves into the camera. They’ve really opened up. They’ve given us everything we had thought and more. And now the burden is on us. We’ve got no excuse. We have the material – even now at our halfway point – to create a documentary that will radically inspire and change people’s lives. Whether or not we do that… is now solely up to us. If you’re new, our crew of 5 dudes left several weeks ago on a cross-country trip across America to film a documentary on “complacency” in everyday life. That’s us, in the picture above. On the left is Grant Peelle (Director), followed by me (for my good looks – or “Producer” as they say), John Cropper (Camera Op), Dustin Koester (Sound), and Bryan Olinger (Director of Photography). Behind us? That’s Karl Malone. He’s our 15-passenger van that has become the mobile locker room for the 6-week voyage. Karl is no RV, but is a straight-up beast in his own right. Click here to “Like” Crank Tank Studios on Facebook. The crew occasionally posts pictures, updates, and random notes from the road there. As I write this post, we’re currently bunked in not-so-beautiful Los Angeles, California. It’s been a whirlwind, but I’ll give you the short version of what we’ve been up to the past few weeks. Our journey started in Wilmington, Ohio, hometown of Grant, John, and Bryan (although Bryan lives in L.A. now). For a week and a half leading up to the launch of the road trip, Grant and I set up shop in a converted office in downtown Wilmington. We stacked together about 10, 16+ hour days of all-out planning, organizing, and decision-making. Here’s what I learned during that time… we have a certain skill set that helps, and a passion that fills in any gaps, but honestly… we have no freakin’ idea what we are doing. I’ve never produced anything in my life, let alone what we are doing on this scale. We’re shooting what most people do in two to three years in 45 days. We’re editing what most people edit in another year or two in 90 days (after the tour). We’ve bitten off way more than we can chew, which is a weird combination of exhausting and exhilarating. We started our journey with several test interviews in Wilmington, Ohio, in the days before we left. We tried half a dozen different styles on different people (thanks to several great friends and community members in Ohio who were willing to be test subjects!). We shot interviews all day and reviewed the footage all night. We ended up scrapping our first half-dozen style choices in favor of a new direction only a day before the trip actually began. While none of the interviews we shot in Wilmington, Ohio, before we left will make the documentary – they were the most important interviews of the entire process for us! With a few days of experience under our belt, we left for the greater Buffalo, NY, area, where a Man Vs. Debt community member had organized a couple dozen people for us to interview. Once again, this experience proved to be an amazing experience for the team. We set up an interviewing area and cycled through all these amazing people for the next 3 hours. Deb and Joe (our amazing hosts) were patient and invaluable to us as we went through the process. During the interviews, one particular woman really stood out to the team. It was at least 11 p.m. by the time we arrived back to Deb and Joe’s home, but we couldn’t resist the urge to film more footage with Paula. So we did what any rational person would do… we phoned her up around midnight to ask if we could come to the horse farm she worked at around 5 a.m. – the next morning – to film her with the horses at sunrise. Sure enough, she was game. 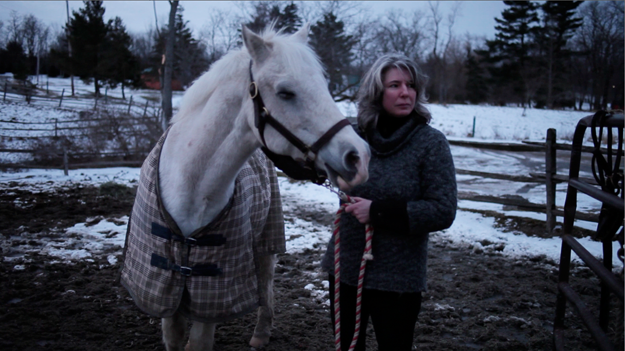 The next morning, on a few hours of sleep, the team rolled into a rural horse farm to film Paula’s morning routine. It was an absolutely stunning backdrop. I’ve never been a huge fan of horses, but it was hard not to be charmed by the environment and the animals. After filming for most of the morning, it was time to move on. 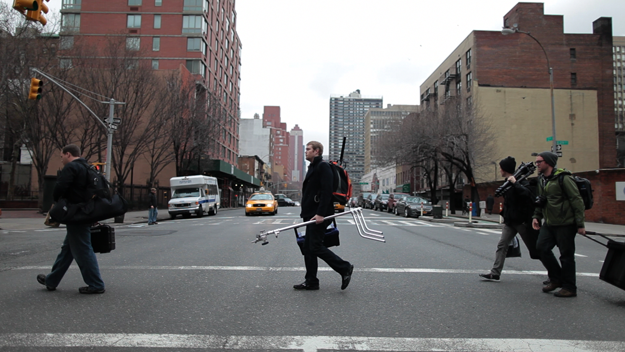 We filmed the story of our host family in the afternoon and left for the Big Apple that night. The next three days were spent navigating the maze that is New York City in a series of amazing interviews. 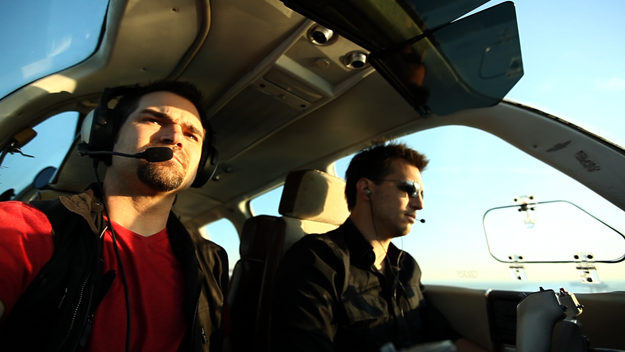 We started with Nik Tarascio, the young CEO of a family-owned charter flight company outside of the city itself. Nik was an absolute blast to spend time with – and was amazing enough to take part of the crew on a flight up and down the Hudson River to get unbelievably cool footage of NYC from the sky. Over the next few days, we interviewed 7 people in two days (including 5 in one single day). Each one with a different set-up, and each person bringing a totally different perspective to the film. Grant and Nik flying the friendly skies over NYC. 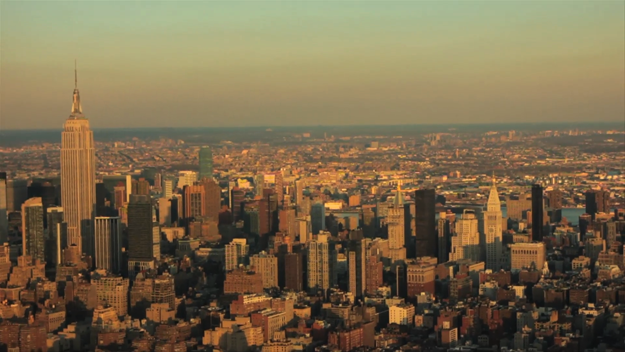 The sun sets over Manhattan… beautiful. 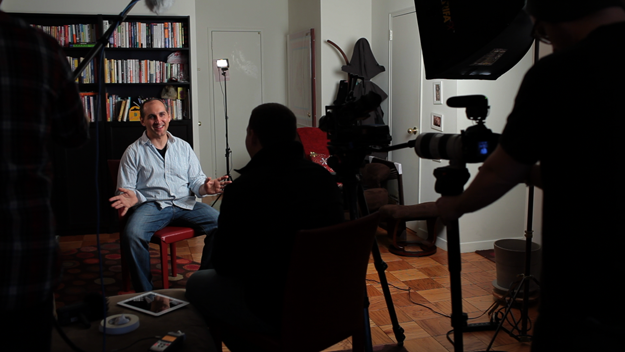 Me interviewing Jonathan Fields, one of the 7 people we interviewed in New York! With little time to rest, we woke up the final morning in NYC to repack Karl and head toward Washington, D.C. 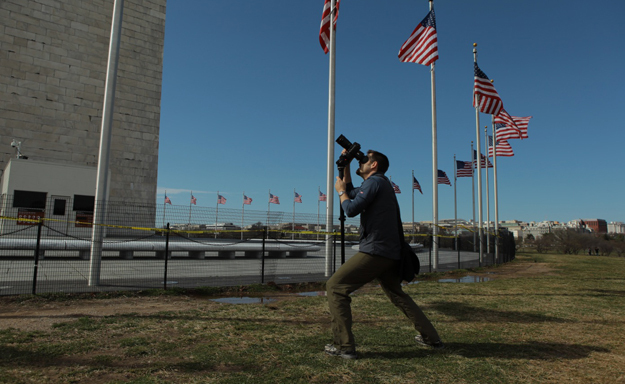 In D.C., we spent the morning filming another Wilmington, Ohio, personality named Sam. Sam has worked in and around Washington politics for decades and had an amazing perspective on complacency in both personal life and government. It was one of my favorite (and one of our most unique) interviews up to that point. The rest of the day was spent shooting the city itself until the sun went down once again. With our natural light all but gone, it was time for another 8-hour night drive to Asheville, N.C.
Of course, as many of you know, Asheville is my home for now – so the drive went quickly for me as I sped to get back to Courtney and Milli. But Asheville wasn’t all rest and family time. We interviewed our friends Matt and Betsy Jabs (who recently moved down close to Asheville) about their experiencing breaking free from two unrewarding jobs and an upside-down house. Next came Steve Kamb – another good friend – who flew into Asheville after leaving a cruise ship just to spend a day filming with us. 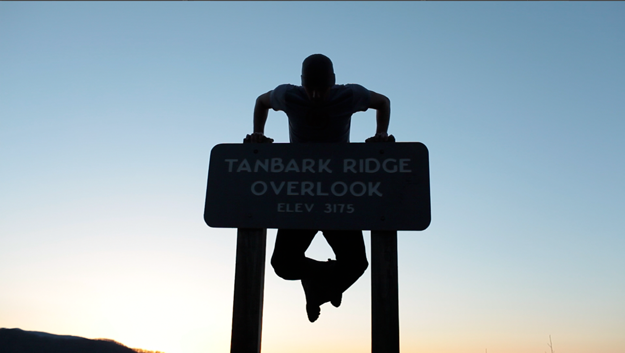 The team once again woke up early to film Steve exercising on the side of an Asheville mountain as the sun rose (at 3,000 feet). But we weren’t done with Steve yet! Next came trail-running off the Blue Ridge Parkway (complete with Grant chasing Steve with a camera through the woods as he ran). 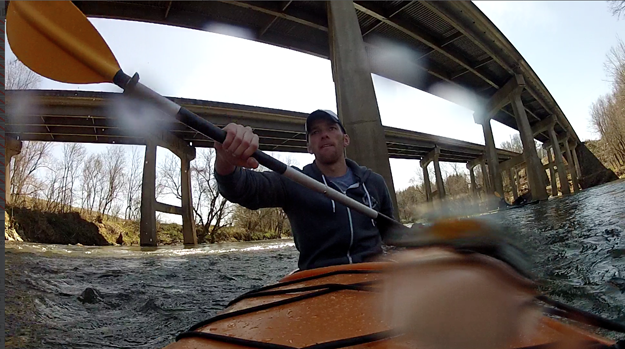 And finally, kayaking down the icy French Broad River. It was certainly one of the most physically exhausting days, but one of the most fun for the crew. Steve’s philosophy on making exercise and fitness fun – and making use of nature – was in full swing. It was midnight, after our packed day with Steve… and once again it was time to hit the road. 20+ hours to Austin, TX, to make it in time for SxSw. It wasn’t a fun drive – and it did include a 3 a.m. nap at a rest stop – but we made it. Tired, smelly, and moving slow, we pulled in around midnight (that’s 24 hours in a van for those counting) to our host family’s house outside of Austin. SxSw was a blur (as it usually is), but what stands out for me was another half-dozen great interviews, a couple amazing parties with great conversation, and the beautiful and kind nature of Victoria (our host) and her husband and daughter. 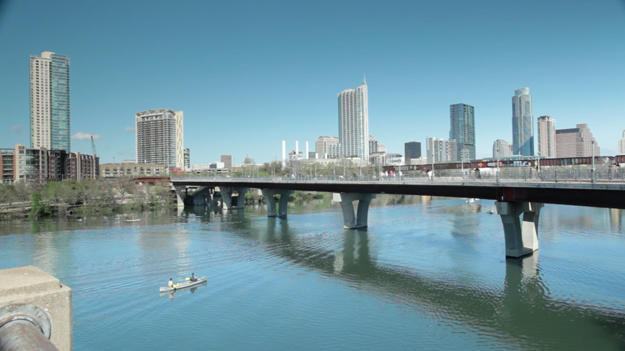 It’s hard not to fall in love with Austin as a city, especially in the early spring. It’s got a wonderful culture, welcoming people, and plays host to an amazing conference once a year. If I could manage the heat in the summer (I can’t), we would definitely consider a base of operations here! 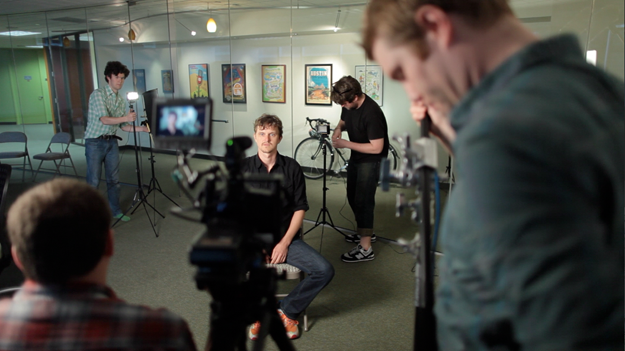 One of our many SxSw interview setups (this one with Max Spiker). After our amazing time in Austin, the crew reluctantly set off for another all-night 18+ hour drive to Phoenix. 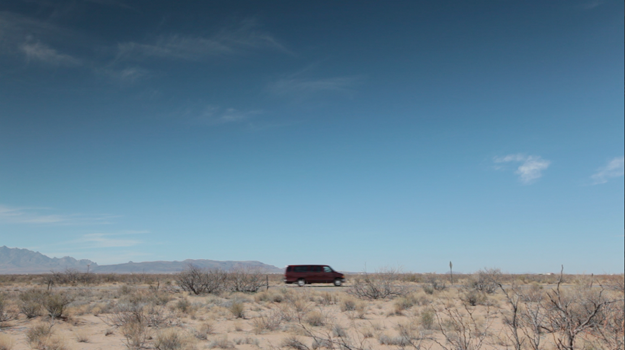 This time, however we stopped in the middle-of-nowhere western Texas for a special 3-hour shoot. As it turns out, when you get into western Texas there isn’t a lot of… anything. Which means you can actually SEE the stars in the sky when you pull off the interstate for a mile or so. 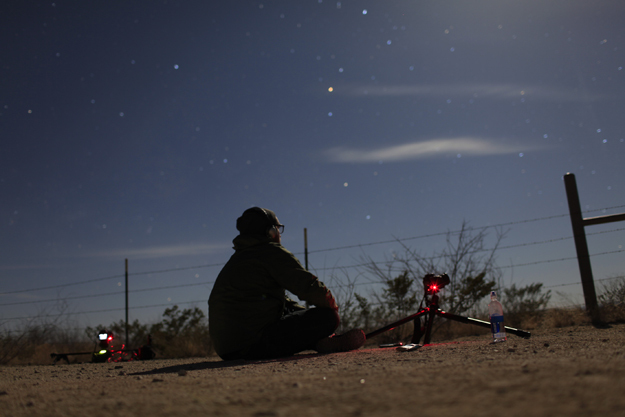 As I napped in the van, the other men set up time-lapse footage of one of the most beautiful night skies I’ve ever seen. It won’t be a big part of the documentary, but the few seconds of footage we use will make the 3+ hours of filming in the middle of the night all worth it! 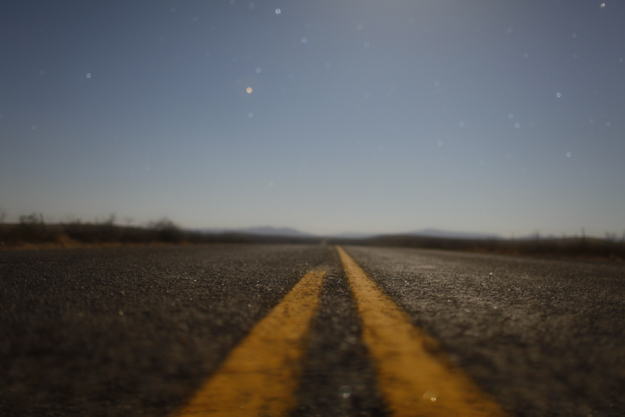 For now, I’ll leave the story here… on an abandoned Texas road looking up at the sky. But trust me, there is a lot more to our adventure. I’ll do my best to update you again in a week or so! Until then, my apologies for being all consumed by this project. It’s the most difficult and challenging creative project I’ve ever taken on. But that’s a good thing. We’ve unlocked a deep, deep issue here. A universal struggle with our culture right now. One that deserves to be explored and shared with the world. We’ve unlocked something powerful. And now it’s our responsibility to complete the journey and share the story with the world. I’m convinced that none of the 5 crew members’ lives will be the same when we return. I know mine won’t. I only hope that we can share this experience with millions of other people – and affect the same change in them (and you). Check out the documentary website for more! Thanks for the update – looks like you’re having a great adventure with making this film. I can’t wait to see the finished product! Thanks for the update. Was wondering how you guys were doing. Sad Victoria and I won’t make the documentary but happy that we could help you get ready in some small way. Continued safe travels. aww, i’m sad i missed y’all at SXSW. SXSW was pretty wet and wild this year. It’s definitely a great place for a home base and kids, except for the heat. Also, I coulda used some inspiration myself and given you guys free condoms for the road. I can’t wait to hear what made you cry and hear the stories. Your project is uber important right now, to me personally as well as the rest of the world. I hope everyone out there realizes their lives are worth more, and have the courage to do what they love and make a difference in the world. Believing this is what makes me so determined to jump… see y’all on the other side! alot out there! Keep up the great work and know it is appreciated! I am so inspired by your project and I can’t wait to see the finished product. I am hoping it will inspire me to change what has become a complacent life…it sure didn’t used to be this way. I am new to your site and your podcast and am soaking it all in. Many, many thanks for your tireless efforts — it is helping me to stay committed to making changes in my own life, day by day. Looks awesome. Keep at it! Make all you can of it! You are so inspiring! Keep up the good work! Thinking of coming to Phila? Nice work! I can’t wait to watch it. It looks like you guys are enjoying yourself as you trek from city to city. Dudes!!!! You guys are doing AMAZING things for the world. Take care of yourselves…Drink lots of water…Rest-up as much as you can, whenever you can. Gotta keep up that strength for the remainder of journey! Thank you. Thank you. Thank you for going for it and making this documentary. Wish I could be there to take a turn driving the van!!! Keep GOING!!! Whooooo hooooooo! Cheering you guys on!!! And sending you big hugs! I am so happy to be able to follow your journey. Can’t wait to see what you put together. I’m sure that it will be magic!! Keep going guys, your final version documentary already looks as if it will be fantastic and a great eye opener. Don’t understand why you cant swing by Ireland to complete the trip. Hi! I was just thinking yesterday, did I missing something, it’s been some time since I heard of the guy, and then here is your post, and I can see you’re on something big! what have you done of your family while you’re on the road? how are coping with that? Your journey in life is quite inspiring and I thank you for sharing this as you do. Sounds like you are making progress….miss the podcast!! We have a decision to make this summer. We can choose our comfortable little life, doing the same thing every day, doing what we’re “supposed to do,” or we can make a move and shake things up. Can’t say much more than that, with the internet being public and all. It’s looking like your documentary could plunk a weight on one side or the other. Wow, can’t wait to see this! Looking forward to having your crew join us on the water for some barefooting next month. I hope you brought bathing suits! As someone who constantly battles whether to continue with the status quo, “normal” life or totally shake it all up and do “what I really want,” I’m really looking forward to seeing the finished product! Awesome, awesome update on the documentary. Keep on trucking. I’m extremely excited to see the final product as I truly believe in your cause and think it will help people tremendously. 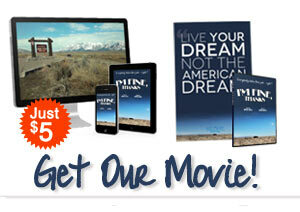 When all is said and done, would love to help promote the film in any way I can. Stay safe out there and good luck with the rest of your journey! Love the update. Wish I could have been in one of those cities to be a part if it. Can’t wait to hear more about it and see the finished product! Baker, this is truly an amazing post and you are really doing something amazing. I have been working on a location-independent business for the past 17 months and on my goal list is to start doing documentaries once project #1 is on a roll. Your post just reaffirmed many beliefs I had and I saw a lot of great things. Putting in the work is important when you are spreading such a powerful message. Keep up all the greatness my friend and thank you for inspiring so many people !! 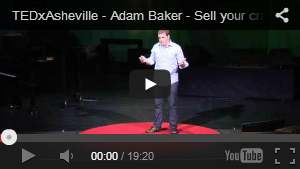 What a great idea for a doco film, one that’s going to resonate with a lot of folks. I’m really looking forward to seeing it when you finish – hope we can access it internationally? 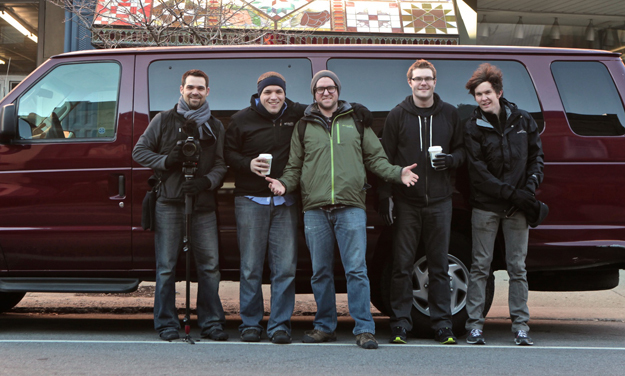 I so much love to be part of crew doing films all over the place whilst touching internet enterpreneur on the road. Hey, will you come to AFrica to interview some people? I think what you guys are doing is awesome. Your courage, passion, and committment to tell the stories of everyday people is truly an inspiration. Amazing guys. This article illustrates what your doing in such a great way. You’re obviously pushing yourselves hard but (hopefully) not losing enthusiasm over the prospect of more hard work to be done. I look forward to see the documentary.